If you think about it, this rough diamond engagement ring trend may have more social significance than a mere fashion choice. Women are now seeking a gem that reflects a respect and adoration for flaws and imperfections. 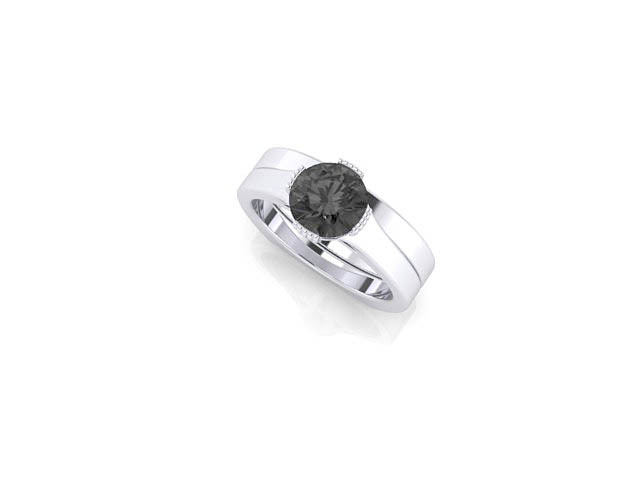 Simply put, rough diamonds are diamonds found in their natural state. Their inclusions are part of their beauty. “Flawless” and “perfection” are taking backseat to the raw, natural beauty of rough diamonds–and hopefully with the way women view themselves in general. 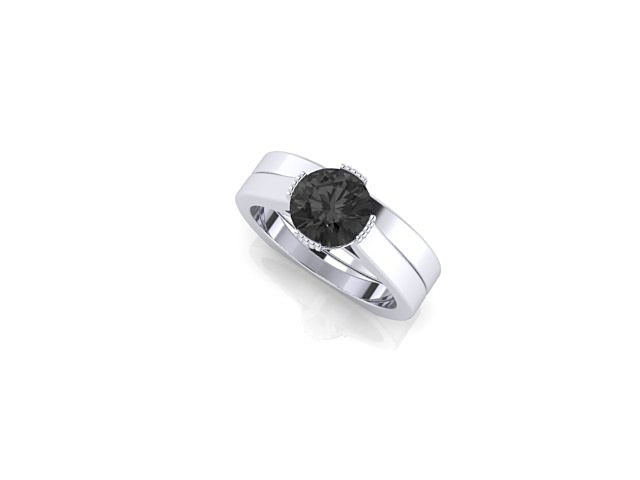 Raw, rough diamonds are also distinctly individual (just like the wearer). Each gem has its own story to tell. The charm emanates from the imperfections and challenges our very idea of what is beautiful. 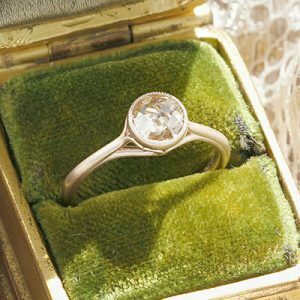 Rough diamonds (or raw diamonds) are becoming a go-to choice for millennial brides seeking engagement rings. And for obvious reasons: there’s an increasing awareness of the damage that traditional diamond mining is doing to our ecology; rough diamonds means a wiser choice for our planet. 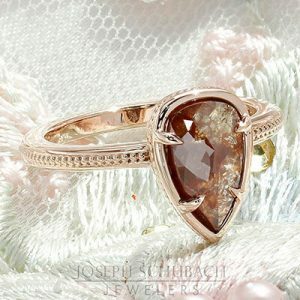 But more than that, there’s a rustic simplicity to rough diamonds that appeals to young brides. 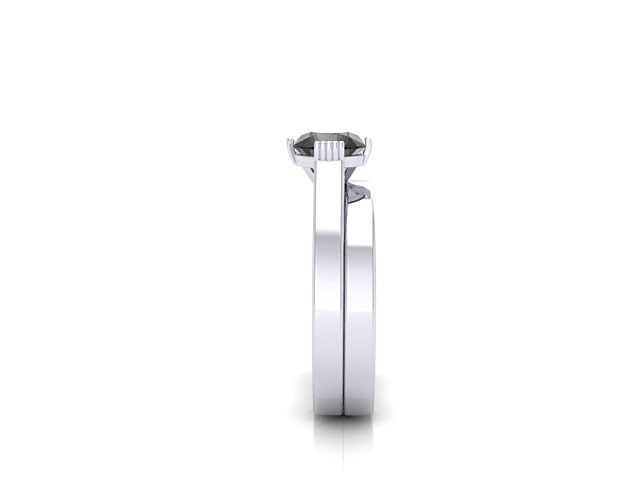 After generations of seeing the same types of engagement ring cuts, today’s woman seeks something more distinctive and natural as a fashionable departure. Whatever your reason, we’re happy to custom design a rough diamond engagement ring that suits your untamed and natural side. A Schubach Exclusive! Custom made bezel set Scroll solitaire engagement ring with a champagne color, rose cut center diamond and surprise diamond accent. 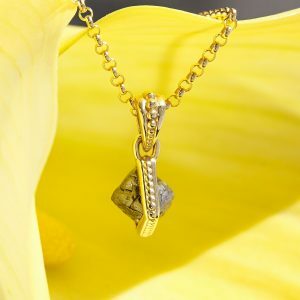 A custom design rough diamond pendant. Once considered a fringe choice for gems, salt and pepper diamonds are taking the fashion world by storm, with brides-to-be purchasing engagement rings highlighting these special “in the rough” gems as quickly as we can custom design them. 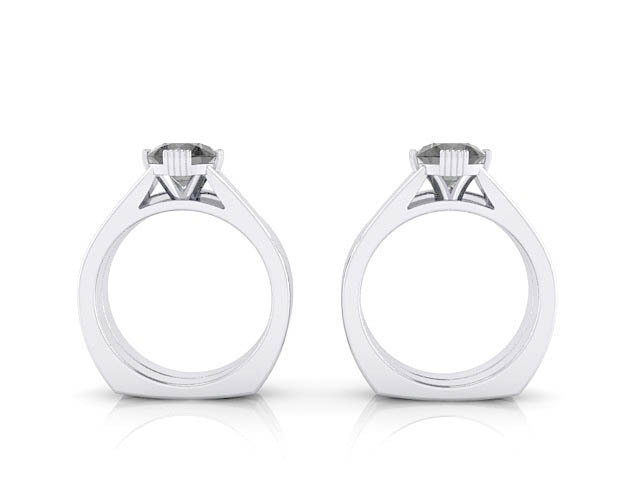 What Exactly Are Salt and Pepper Diamonds? A flawless diamond is considered the most desirable diamond…but salt and pepper diamonds work differently: the flaws of salt and pepper diamonds are what provides the beauty and sweet, earthy sparkle. 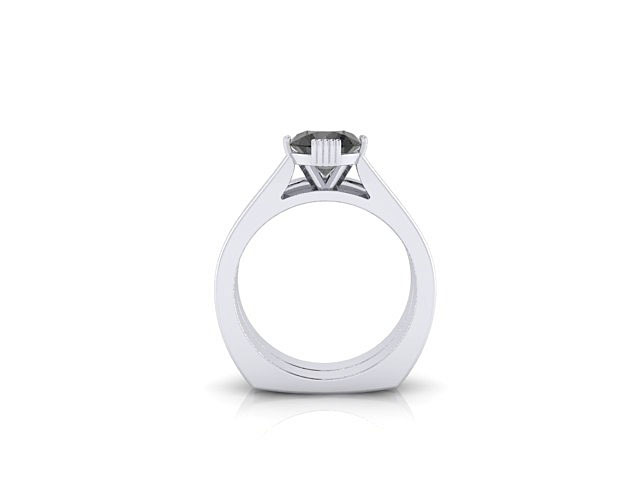 The inclusions in salt and pepper diamonds come in different colors, sizes and shapes. “Salt” means the white inclusions while “pepper” indicates the black inclusions. The combo of white and black inclusions gives it that salt and pepper look. 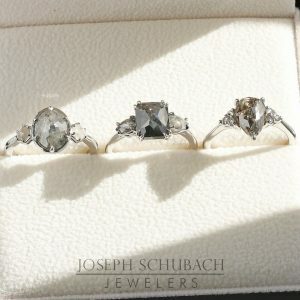 Shopping for salt and pepper diamonds is also a completely different process than when shopping for flawless diamonds. The 4 C’s (Cut, Clarity, Color and Carat) simply don’t apply here. These gems are raw and rough. There’s no striving for perfection but an embracing of its simple and raw quality. 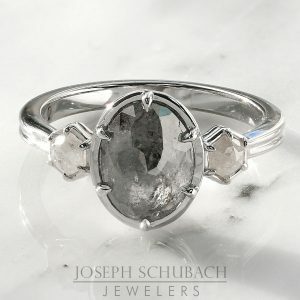 With salt and pepper diamonds, the inclusions make the beauty! The gems have a simple yet wild feel to them, perfect for a woman who creates her own rules and embraces both her light and dark sides. She takes risks and feels passionately, without abandon. She’s attune with the natural world; she’s a force of nature herself. 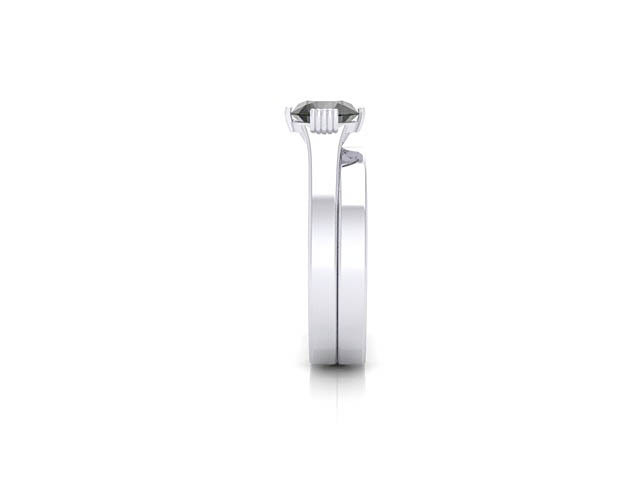 Her engagement ring with salt and pepper diamonds represents these varied and untamed sides.